It’s a bad week to be an exceptional animal. First, Paul the psychic octopus became calamari, and now another incredible animal has shuffled off the mortal coil. Or, in this case, many coils. Fluffy, the longest snake ever to live in captivity, has passed on at age 18. He was found dead in his enclosure this morning at the Columbus Zoo. When we say Fluffy was a massive snake, we’re talking massive. Fluffy was 300 pounds, as long as a moving van, and as big around as a telephone pole. Fluffy, at 24 feet long, was the largest snake ever held in captivity. 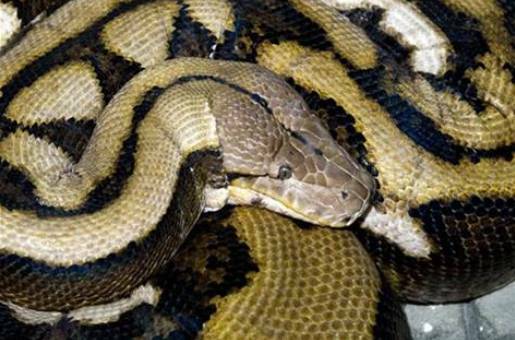 The longest recticulated python ever was a 32-foot monster killed in Indonesia in 1912. I think everyone at the zoo should get a Fluffy belt, and they should sell Fluffy-made belts at the souvenir stand. His fans deserve a memento of his life, and I deserve a really awesome pair of boots made out of Fluffy’s incredible skin. It’s win-win! I just hope Fluffy got to enjoy one last cigarette.